Darjeeling is a popular among the Himalayan range of hill stations. Located at an average height of 7000 ft is known as Queen of Hill stations. Darjeeling offers different experiences and climate at different seasons of the year. Mt Kanchenjunga the worlds third highest peak is visible from Darjeeling most of the time when clouds are not there. 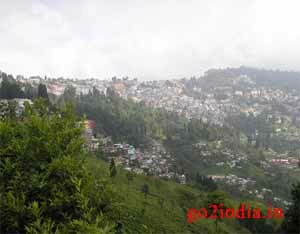 Tourist from all part of the world visit Darjeeling in different time of the year. By air the nearest airport is Bagdogra, located at a distance of 95 Km from Darjeeling is connected from Kolkata, Delhi and other important airports. By road Darjeeling is connected from NJP ( New Jalpaiguri ) at a distance of about 90 KM hill road on National Highway number 55 ( NH 55). It takes minimum three and half hours to reach Darjeeling. The best way ( but takes more time ) to reach Darjeeling is by toy train which runs between NJP and Darjeeling. Train journey takes more time and it is popular among tourist only. Locals prefer the road journey as it takes less time. Train can be seen at many places during the road journey as the rail track kiss � cross the road many places. From NJP shared vehicles can be taken for road journey or full vehicle can be booked for Darjeeling. Shared vehicles are economical for travelling alone or for a small group. Tata Sumo and other MUV are usually used in this hill roads. Tiger hill is located after Ghum and from a three road junction one has to climb up to go to Tiger hill. To view sunrise you must leave from your hotel at Darjeeling by early 4AM. Book your vehicle for early morning tour to peak of Tiger hill to enjoy Sunrise and the view of Kanchenjunga with change in color as the sun rays falls on it. But this spectacular view is possible if sky is clear and best time to expect a clear sky is in the month of September � October and in winter times. Other months it is your luck to get a clear sky in early morning. But this area has its own rule of weather and some time even in good seasons also the sky remains covered. There is a observatory for tourists to stay and enjoy the natural beauty. One can stay outside the observatory and watch the sun rise without paying any entry fee. 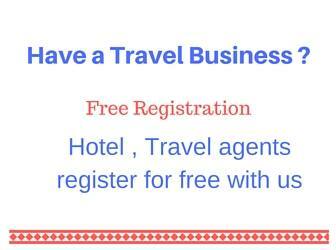 The entr�e fee for ground floor is Rs 20/- and for first and second floor it is rupees 30 and 40 respectively. All floors are provided with glass window to watch the sunrise. This is mainly to protect from early morning cold wind blowing from Himalayan snow hills. All entry fees includes one cup of complementary tee inside the observatory. On 29th May 1953 history was made as Tenzing Norgay Sherpa along with Edmund Hillary became the first man to climb Mount Everest. This institute located at Darjeeling gives training to mountaineers and host a beautiful museum with many photos and equipments used in mountaineering purposes. 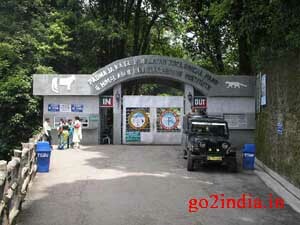 Entry fee to Zoological park is Rupees 10 and to the museum is rupees 10. There are different Himalayan species of animals and birds including famous red panda kept inside the zoological park. 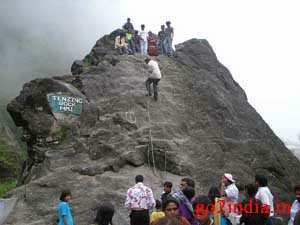 There is a rock known as Tenzing rock for the tourist to test their maintaining skills. This war memorial was constructed by the zilla sainik board, Darjeeling in memory of brave gorkha soldiers of Darjeeling hills who have laid down their lives for the country in all wars and operations since independence. This memorial was sanctified on 22nd march 1995. 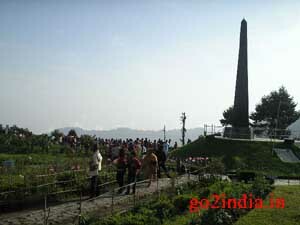 There is an entry fee of rupees 5 to this memorial and photography is not allowed on the sacred mound. One can visit this memorial from toy train also as it goes around this memorial making a circular path to gain height here. Many local handicrafts and woolen items were sold by local peoples here for tourists. The Buddhist temple is located near the peace pagoda. This temple is designed in traditional Japanese architecture. Photography is allowed inside the temple but restricted during prayers. Building peace pagoda was initiated by Fujii Guruji ( founder and preceptor of Nipponzan Myohoji a Buddhist order for word peace ) a close associate of Mahatma Gandhi having seen tragedy of Atom Bombs in Hiroshima and Nagasaki in 1945. This pagoda stands as the core of spirituality and peace. The foundation stone laid by the most Ven Nichidatsu Fujii on 3-11-1972. This one was inaugurated by the senior most disciples of Gurujii on 1-11-1992. 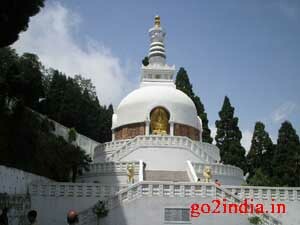 The height of this peace pagoda is 28.5 m and diameter is 23 m . The period of construction was 36 months. This peace pagoda is designed by Dr M Ohka ( Japan ). This is one of the famous Monastery of Darjeeling. There is a Buddha status of 15 foot height inside this Monastery.